Objective: learn how to communicate with customers through inCust mobile app for customers, add news or special offers. You can add promotions, news or special offers to inCust mobile app for customers using Control panel. For this go to ‘News and info’ and click ‘Add news, special offer, information’. 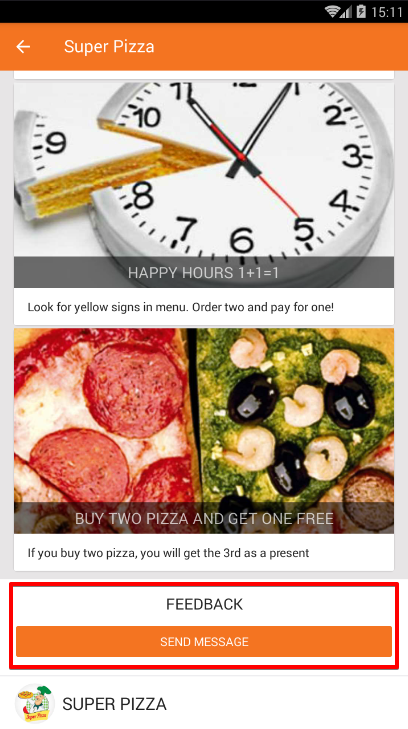 You can add promotions, news or special offers to inCust mobile app for customers using Control panel. For this go to ‘News and info’ in the Control panel and click ‘Add news, special offer, information’. Choose ‘Section in your portal’. Portal is page of your point of sale in mobile app for customers, which includes info about point of sale, description of loyalty program and all news, promotions and special offers. 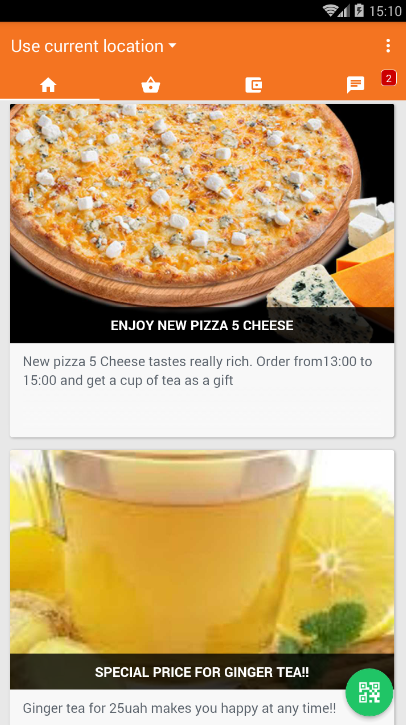 News and Special Offers is the only section, which content is duplicated in the newsfeed ‘News and Special Offers’ on the main screen of inCust mobile app (with the appropriate Pricing Plan or when the user has added your point of sale to ‘Starred’). By the way, you can add sections ‘Gifts’, ‘Best Deals’, ‘Goods and services’, ‘Blog’. These sections are published in the portal of your point of sale in a mobile application and are not duplicated on the main page. In these sections you can add information about any updates and share useful information with customers. Select the term of publication of this news. You can plan it for future marketing activities in advance. Select today’s date for the beginning of the publication to see it in a mobile app now. Then add picture (make it colorful and necessarily thematically related to the news that you are publishing. Remember that customers are more likely to pay attention to the bright and interesting picture). Look at the main page of application. You see examples of materials. In Control panel in ‘News and info’ add short news title, short description (10-15 words) and full description (30 words). In the app short description will be displayed on the main page under the picture and customer will see a long description by clicking on the news. We highly recommend to add a description in three languages in order to maximally expand the news among potential customers to attract them. Our app displays information in the language that is configured on the interface of the user’s mobile phone. In addition, you can redirect the customer from news to your website by adding link to this news where it will be described more detailed. Click ‘Save and close’ and with the appropriate Pricing plan news will appear on the main page of the user app. Go to your mobile app to look at your news on the main page. The more geographically closer is customer to one of the points of sale of your business, the higher your news or promotion is shown in the newsfeed on main page. Find your news on the main page and by clicking on the button Show point of sales go to your point of sales. You get into your point of sales portal. All news and promotions are displayed here. If your possibly potential customer has questions, he will send you a message by clicking on Send message. Let’s send a test message. This message goes to you in Control panel to section ‘Messages’. Enter Control panel then enter section ‘Messages’ choose today date and click on ‘Show messages’. Take look at this section regularly to respond in time to customer requests and answer their questions. Write answer for test by clicking ‘Answer’ and return to mobile app section ‘Messages’. Your answer to customer is shown here. In addition, you can motivate customers to make purchases by sending them personalized news. Go to Customers tab in the Control Panel. 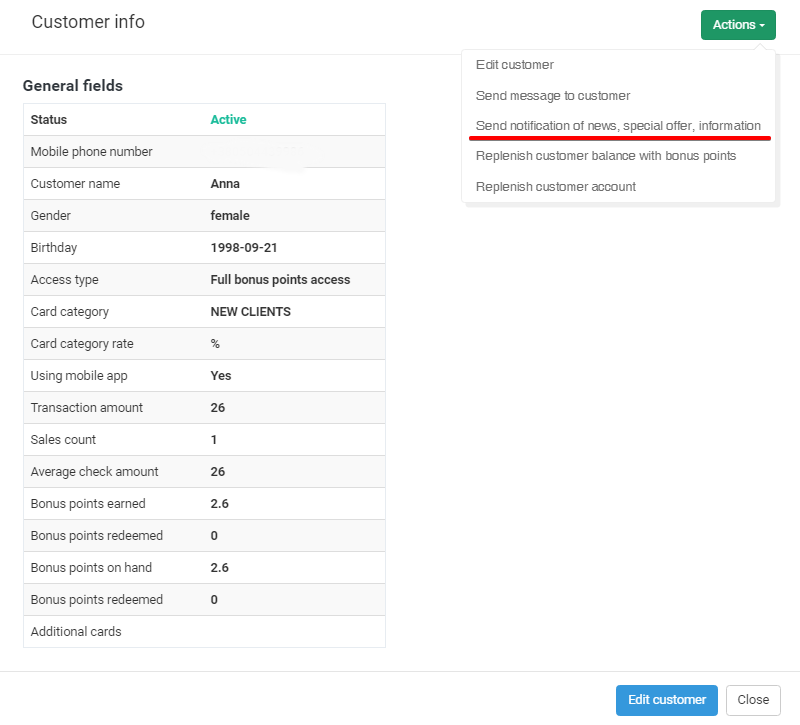 Select the customer number (preferably yours for example) and click Details. Click Actions and then Send notification of news, special offer, information. From the drop-down list choose the news that is potentially interesting to the customer and confirm sending. On the phone, which number you have just selected will be sent push-notification with reference to the news. Keep in touch with the customer and being able to respond to his requests is the key to customer loyalty to your business.